Munch-n-Done is a lightweight Anti-Grazing Riding Muzzle. Check out our NEW Deep Muzzle Munch-N-Done®! Scroll down this page for more info! The Munch-N-Done® is a lightweight, low profile solution to the nibbling issue. The strapping is not designed to be cinched down tight around the muzzle. The elastic in the strapping should not be stretched if applied correctly, and if using a nose-band strap, it should not be pulling your nose-band down. Step 1: After removing the Munch-N-Done® from it’s package, pop and smooth the darts out to create a nice basket shape to form around your horse’s muzzle. It is designed to be form filling, and will cup the muzzle snugly. Step 2: The Upper Munch-N-Done® strap (Longer strapping with our Logo on it) is fed through the headstall cheek-piece loops on both sides, from top to bottom, where your bit is attached to the headstall. Once fed through, go back up behind the cheekpiece, against your horse’s skin, and feed, from the top again, back down through the cheekpiece loop. You are creating a loop with our strapping, around the backside of your headstall cheek-piece loop. 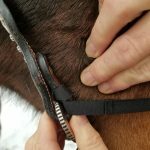 Step 3: The Upper strapping loop velcro is then pressed firmly into the lower strapping hook velcro under the horse’s chin. Step 4: Check to ensure the Munch-N-Done® is centered on the horse’s nose, and fitted snugly, but not tightly. The elastic should NOT be stretched out when applied correctly. The basket of the muzzle should seat up against the front of your horses’ muzzle. If it does not, your Munch-N-Done® may be too small. Excess velcro can then be trimmed off with a scissors for a neater look. The entire process of tacking up the horse with a Munch-N-Done® takes less than a minute. 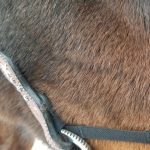 We recommend creating one loop around the back side of the cheek-piece before securing the strap below the horses’ chin. What happens if my horse gets loose while wearing the Munch-N-Done®? No worries! The Munch-N-Done® is designed to be used only while under saddle. This means that while under your control, with you at the steering wheel, you are preventing your horse from rubbing their muzzle on any objects. If left to their own devices, they will eventually be able to work the Munch-N-Done® to one side or the other. 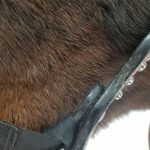 If it should catch on anything, like a twig or stick, the velcro strapping will give long before your horse could even think of getting it actually hung up good and solid on anything. So fear not, your horse will not starve to death, and will most likely be found happily grazing away by the time you do get caught up to him (or her). Do I order the regular Munch-N-Done,or should I be ordering the Deep Muzzle version? Our regular Munch-N-Done® is suitable for owner ridden horses. It works best on horses that tend to be very well broke, laid back and non-reactive to new things or situations. It works well with horses tending towards the lazy side, that are quiet on the bit. Our Deep Muzzle version should be chosen if others will be riding your horses. Children, non experienced riders, and dude strings should look at this option only. The deeper basket almost completely prevents the possibility of our product sliding off to one side, and is designed to be used on horses who’s riders may not be paying the most attention to what is going on. This option should also be chosen for the forward going horses, who may tend towards being high strung, and may also exhibit behaviors like fidgeting with their bits. Sizing is critical. You want the Munch-N-Done® to cup the muzzle, but not so snug that the darts are preventing the mesh basket from seating down against your horses’ muzzle. You do not want it so large that the mesh is covering the nostrils, or gapping way out and away from the muzzle on the sides. On the appropriately fitting Munch-N-Done®, our Logo should rest 1 1/2″ to 2″ above the nostrils, the nostrils should not be covered by mesh, and there should be minimal gapping on the sides. You are better erring on the side of a little too large. You cannot get away with a little too small. Typically, our Mini B size fits your larger Miniature Horses. It is generally going to be too large for the smaller Mini A size miniature horses. The pony size should fit most Shetland ponies, hackney ponies, or other ponies roughly 10-11 hands in height. Our Arab/Cob size should fit the larger ponies, or small horses (up to about 14 hands high) with small, refined muzzles. Our Standard horse size fits most stock type breeds, quarter horse type heads, 14-15.2 hands in height. The Large Horse size fits most draft crosses, Norwegian Fjords, large Halflingers, Fresians, and big gaited horses, Our Draft size is for very large full size draft horses. Following is a rough estimate on best fitting options. If your pony or horse is right at a borderline, we recommend going up a size as you can get away with a little too big. You can’t get away with too small. Keep in mind, this is just a rough guesstimate. If your horse has large, widely set nostrils, err on the side of caution, and order the next size up if you are right at a borderline bit size. Remember, Munch-N-Done® offers free 30 day size exchanges. Return your clean, unused Munch-N-Done®, proof of purchase, and detailed instructions on new size desired, and we will get it on it’s way! If you have any doubts as to whether your Munch-N-Done® is fitting correctly, shoot us an email, with pictures, front and side view, of your horses wearing it’s Munch-N-Done®, and we can tell you immediately if it is a good fit. If you are concerned about ordering the correct size, shoot us an email or give us a call and we can assist you with ordering. What if I ride with a Halter? In order to use a Munch-N-Done® while riding with a halter, you will need to ensure that your halter has a snug fitting noseband. Munch-N-Done® does work with both web and rope halters. We recommend ordering our Deep Muzzle Edition for riding with halters. 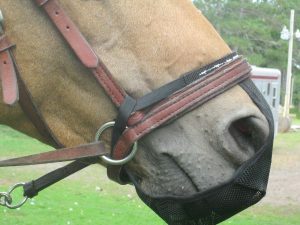 The screen mesh comes back a bit further on the sides of the muzzle, and greatly decreases the possibility of your horse getting the Munch-N-Done® pushed to one side or another. You will need to order it with the optional NoseBand strap. 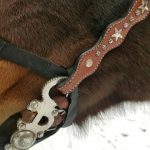 If you ride with any of the above bits, or any style bit that requires an unusually short headstall cheek-piece you need to mention in the comments box when you order, that you need longer strapping. Forgot to do it while you ordered? No problem, just shoot us an email to munchndone@gmail.com ASAP and we will make sure to send you our product with longer strapping. There is no extra charge for this. Nose-Band Straps are now also an option on all of our Munch-N-Done® sizes. This is a velcro strap that attaches the Munch-N-Done® to the existing nose-band on your headstall, or the nose-band of your halter if you ride with halters under your headstalls. It provides extra stability to the Munch-N-Done® and prevents the Munch-N-Done® from possibly sliding down the nose should the horse rub on something. There is an additional $2.00 charge for this option. 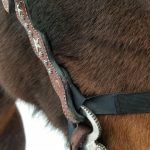 Obviously, if your headstall does not have a nose-band strap incorporated into it’s design, or you do not ride with a halter under your headstall, you do not want the nose-band strap option. This strap comes quite long, and will likely need to be trimmed to fit with a scissors. Munch-N-Done® does work on bitless bridles. You need to order your product without the optional NoseBand Loop. This strapping comes long enough for the unconventional means of attaching your Munch-N-Done® to a bitless bridle. The upper strapping is simply looped around the junction of the cheek piece and the nose-band. You do not want to order the optional nose-band Strap as on most bitless bridles, the Munch-N-Done® will come to rest UNDER your existing bitless bridle headstall, in most cases. You can get quite creative in finding a method of attachment that works for your selected tack. What you want to avoid is ANY attachment method that interferes with rein and/or bit action. What Doesn’t our Munch-N-Done® work On? Due to the loose fit of the average side-pull or bosal, it is not recommended that Munch-N-Done® be used on these types of tack. The relative loose fit of these headstalls allows the Munch-N-Done® to slide around more than it should, and it could actually slide off to one side or the other. Munch-N-Done® does work on rope and web halters, as long as they are snug fitting to the horses or ponies heads. Make absolutely sure your horse is used to wearing it’s Munch-N-Done® from the ground before you climb aboard. Behavior you can expect: lip wrinkling, blowing through the nostrils, attempts to grab the sides of the Munch-N-Done® with their lips, rubbing their nose on their front legs, the ground, and stationary objects like trees, posts etc. If you have access to a round pen, apply the Munch-N-Done® and walk them right out. Keep them moving. If you have no access to a round pen, lead them out on a lead rope or by their reins. It is VERY important while they are getting used to it, that you DO NOT ALLOW THEM TO RUB ON ANYTHING! Once they have quit fussing with it, allow them to try taking a nibble. Do not allow them to try hard enough or close enough to the ground, to actually rub their muzzle on the ground. You need to let them try a few times, so that they teach themselves that their days of nibbling are over. Surprisingly, they learn this shockingly fast, and usually by the end of the first ride, they are no longer trying to grab anything. Contrary to what you may think, horses do NOT develop a resentment over this, so do not fear your horse will all of a sudden hate you. At this time you can mount up and ride out. We have also found with our own extensive field testing, and testimonials from our customers, that after regular use, you can actually start riding them without their Munch-N-Done® and they will not nibble. Just an occasional refresher is needed every once in a while to remind them where their focus needs to be. This is a much more humane method of “training” them out of this behavior, and it completely eliminates the battle. No more Jerk and Spur. You WILL get your horse’s focus back, and you can honestly Start Enjoying That Ride! We do offer a riding muzzle built ultra heavy duty, with a little different design. 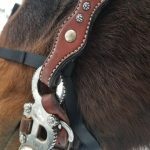 It is designed to be used in order to give your horse near complete freedom of head in heavy cover and off-trail settings. These Munch-N-Done® come with a wider, heavier duty webbing and velcro on the Pony, Arab/Cob and Standard Horse sizes, and a deeper basket. Ideal also for horses that tend to have very active lip and mouth movement while going down the trail. Used extensively on Scented Search and Rescue teams, it is also ideal to be used by riding stables where novice riders will be riding your dude string or lesson horses. We offer 3 different colors, black, blaze orange (add 2.00), and lime green (add 2.00). These are available in Pony, Arab/Cob, Standard Horse, Large Horse, and Draft sizes. The NoseBand strap is an option that is available (add 2.00). FREE SHIPPING on all USA orders over $100.00 Just choose Free Shipping at checkout! We ship United States Postal Service (USPS) only. International Shipping: We ship EVERYWHERE! Simply add your desired items to your cart, and shipping charges will appear before actually placing your order. Please note international orders can take up to 5 weeks for delivery and that any additional Import or Customs taxes incurred at time of delivery are the sole responsibility of the buyer. Include new size desired, your name, your mailing address and the PayPal transaction #. As soon as we receive the item, we will get your exchange mailed or refunded, minus shipping charges. Munch-N-Done is now offering wholesale pricing on our Munch-N-Done®, Deep Muzzle Munch-N-Done®, and our Bug-GIT®s. There is a minimum order requirement of 12, and a discount of 25% will be applied to the order. There is free priority shipping on all USA wholesale orders. Simply order a quantity of 12 of more of any of our products, and the 25% discount will be applied. Now Available in the UK, and readily available in Europe! Munch-N-Done® now has an authorized distributor in the United Kingdom! Gone are the long wait times for shipping all the way from the USA! Be sure to check out our sister website, The Horse Riding Muzzle UK for ordering information in Europe. Both the Munch-N-Done® and the Deep Muzzle Munch-N-Done® are available and ready for shipping. Have any questions? Just drop an email to thehorseridingmuzzleuk@yahoo.com.